Apartment construction in metro Oakland now makes up 36% of total construction in the Bay Area, with 6,300 units expected to deliver in East Bay over the next 18 to 24 months. For comparison, Oakland has received just 20% of all new Bay Area supply this cycle. Since early 2010, Oakland has picked up more renters priced out of San Francisco, and to some degree, employers now are starting to move across the bay, as well. 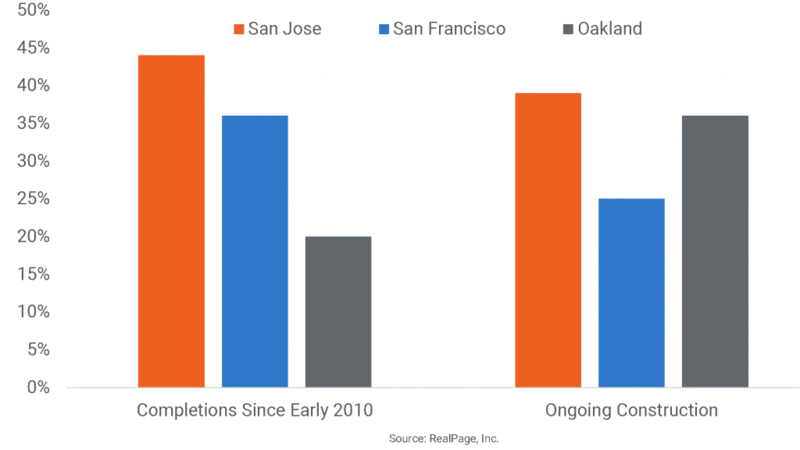 These trends have caused the sudden spike in construction in Oakland. The 6,300 units currently under way in East Bay make up the largest construction volume in more than two decades and will expand the inventory base there by 3.1%. The lion’s share of new product is under way in the urban core.